We are, and always have been, big fans of open source software. In our daily workflow at Pelago we use various open source technologies; PHP, MySQL, PostgreSQL, Linux, Apache, Subversion, and many others. We primarily use these open source technologies in developing Intervals, our online time, task and project management software, and in designing and developing web sites and web-based applications for our clients. When selecting online project management software for your company, not everyone wants to use a hosted pay-per-month app. Some would rather download the app and install it on their own server, taking responsibility for the IT aspects of maintaining and serving up the application. This blog post is for those people. We’ve put together this review of open source project management software based on our experience building Intervals, along with ten years of designing and building web sites and web-based applications. 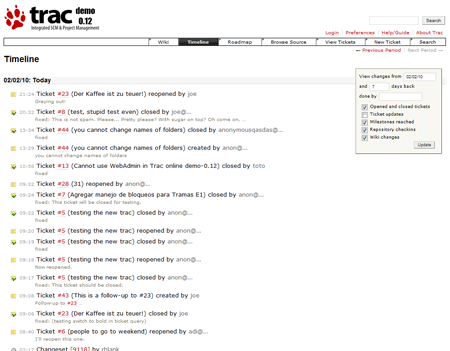 Trac is powerful open source project management software built using Python. We’ve used it several times in the past when working with clients who used it as their primary ticketing system. Trac’s strong points are its Wiki and Source integration. And Trac open source project management software is similar to Intervals in that it treats tasks more like tickets, assigning them fields such as priority, owner, component, and milestone. Overall, web developers will find Trac a great tool to work with, as it lets them manage projects and tickets on a very granular level. Web designers and others who like their interfaces clean and less cluttered may find Trac project management a bit cumbersome. Trac has been around longer than most open source project management apps and has the benefit of being more established and battle tested. 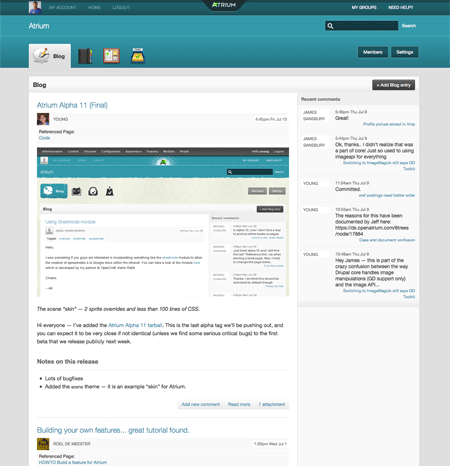 Open Atrium is relatively new on the open source project management scene. However, they’ve used their status as the new app on the block to their advantage, offering a refreshing interface and more intuitive features. And by building it on top of Apache, PHP, MySQL and Drupal, they’ve given the open source community an easy and familiar code base, guaranteeing a lot of help with development. Although Open Atrium is still in beta it looks very promising. This open source project management software emphasizes communication and collaboration, while including a full ticketing system. Open Atrium offers a nice blend of collaboration and project management features and is a great option for those looking to replace Basecamp. Collabtive looks like another open source project management app aiming to be a viable alternative to Basecamp (one of the key features is a Basecamp import). Collabtive is one of the more full featured open source options for project management, offering the ability to track projects, milestones, tasks and time, and rounding itself out with reporting. Just the fact that it includes so many key features for managing projects is a good reason to give it a try. The interface is nice and clean but relies too heavily on icons for navigation. Overall, it is a promising app that still has some development needing to be completed. Redmine reminded me a lot of Trac except that Redmine is written in Ruby using the Rails framework. Redmine contains a lot of functionality geared heavily towards developers. It’s powerful but may take some getting used to. This open source project management application is ideal for developers who are familiar with Ruby and need self-hosted software written in their favorite language. The default interface is not as clean as Open Atrium or Collabtive, but the whole point of open source is that it is free and you can contribute your enhancements back to the development community. 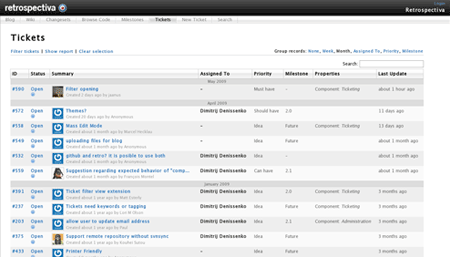 Retrospectiva is another open source software offering that includes ticketing along with project management. It is similar to Trac in that it offers Subversion integration. What makes Retrospectiva unique is that it targets itself to the agile software development cycle. Not only does it provide the tools to carry out agile software development effectively, it also enhances the process with collaborative tools such as a Wiki and a Blog. 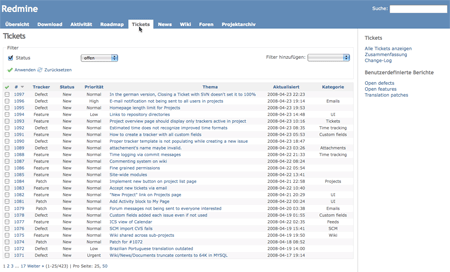 Retrospectiva also has one of the cleaner interfaces among the open source project management software apps built by and for web developers. Also written in Ruby, this application looks promising. Which open source project management software is the best? That’s up to you. They are each unique in their own way and require a test run to see if they will be a good fit for your company. These open source project management software offerings do seem to have one thing in common.. They all have some type of comprehensive ticketing system. Whether it’s under the guise of issue tracking or task management or ticketing, it’s there. That’s probably because these apps are written by web developers who understand the importance of a comprehensive task management system. If there is one thing the open source world can offer to proprietary online project management software, it’s detailed task management. And if there is one thing the open source developers can gleam from the proprietary apps, it’s the attention to detail in the user interface. There will always be pros and cons to choosing between open source and online proprietary project management software. Should you decide to go the open source route, we hope this review will be helpful in making that decision. As always, please feel free to comment on other open source project management apps you’ve found useful. We’d love to hear about more. I am surprised for “project management” you didn’t include dotproject, web2project or Openproj. Those are examples of what I call true project management apps. Openproj is interesting in that it provides a much needed .msp reader too. Using JSF, Hibernate, Spring, JBoss RESTEasy, PrettyFaces, PrettyTime, and other emerging technologies. It’s still in its infancy, but is easy to use if you are familiar with Agile/Scrum. It provides full access to all functions through REST based SOA, so if you just want to use the base platform for your own interface, you can, but the interface is relatively simple and straightforward as well. Correction here : Trac is written in python not in PHP at all…. Thanks guys. I’ve fixed the post to reflect that Trac is developed in Python. What is the purpose of project management? To help you organize better? If you are using PM tools and you are in business for yourself or in a company, the purpose of project management is to manage time, scope, and budget so that you can make a profit. Any self-proclaimed PM software that lacks the ability to manage these three competing demands is just a nice organization and/or collaboration tool. Specifically, you must estimate time for completing tasks and record actual time to see if you are on time and on budget. If the client adds scope, then you need a way to record those tasks as either future requests for another phase, or change requests/orders that will increase the schedule and price. For managing many projects at once, a dashboard view across projects is good along with associated resources so you can forecast resources and see overlapping commitments. I fell in love with the UI of ActiveCollab (not open source, but ‘install yourself’ model at a one time low price), but again it fell under the category of an org and collab tool. Thanks for the review as I am constantly searching for more efficient PM tools. I’m surprised to not see JIRA on this list. It’s not free, but it’s a one-time fee–there’s no need to continue paying for a support license. In my opinion it remains the most flexible, full-featured project management tool available, open source or otherwise. I’ve had a good deal of success using JIRA to track code sprints and longer-term milestones. The permissions system allows a great deal of granularity. There’s a lot of integration with other open source tools. There are plugins within JIRA for associating tickets with source control commits, it integrates with Mylyn in ecilpse (and NetBeans has native support for it), Hudson has a JIRA plugin as well, etc. Some of the more interesting agile practices have plugins written for JIRA now, including GreenHopper, which allows for a sticky-note board within JIRA itself. Definitely worth a look (and review). Nice to see a PM list that stirs away from the usual boring ones like dot Project, etc. I wasn’t aware on Retrospectiva and Open Atrium. Gonna have to have a go. The git integration in Retrospectiva looks cool. You may want to take a deeper look at Redmine. It has features you laud in other products. For example, it has Git, Mercurial, and Bazaar integration as well as Subversion. It has an integrated blog, wiki, and document repository. 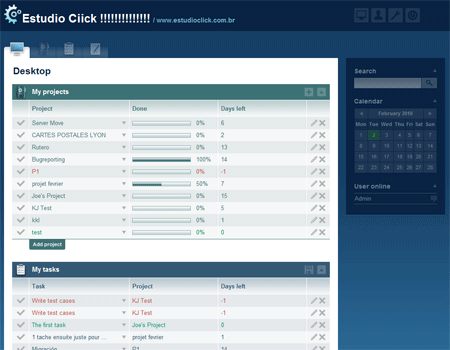 It also has build and release/milestone management and time tracking. There are plugins available to customize it in many different ways (burndown charts, etc). Unlike some of the products mentioned here which don’t go much beyond a defect tracker, Redmine can manage multiple aspects of a product. Endeavour Software Project Management is an excellent Open Source alternative! Clean and intuitive user interface and provides support for all software development artifacts including wiki integration. It is ideal for web based projects and handles remote client/remote team easily. What kind of project? Size? Software or building x? For a customer? AC is nice but it is too expensive for most people, especially since the Small Biz doesn’t make sense for most people. A ticketing system reviewed as PM software? On what planet? Look, ticketing systems are great for service desk applications, where you have continuous delivery of small fixes, but that’s *not* a project. What you have here is a review of ticketing systems, some of which have some additional features that might help in a project environment. Martin Burns: So what Open source PM software do you recommend? I’ve used Trac a lot, however, it does feel a little cumbersome which is most likely due to its being around for a long time. It could probably use a good overhaul. If you are doing task management like you would issue tracking, Trac is very good. It’s more technical in that respect. However, I really like what I’ve seen with Open Atrium. It does a lot of the same stuff as Trac but the flow seems more current to what we are familiar with in more current apps. It is a little easier on the eyes and will be easier to install for those familiar with PHP. I have found Endeavour a very useful tool specially that it is open source. You can download the source which is in written in Java for further development. It is compatible with different dbs and it is web-based. There are still a few useful functionalities missing (time tracking, detailed task management, etc). Which of these PM Apps do you recomend for an animation studio? Without knowing the workflow needs of an animation studio I could not answer that question. I would recommend trying each one until you find one that fits. Or perhaps ask around on animation forums to see what they recommend. If I had to choose one I would tell you to pick Open Atrium. This is because they are likely to have the biggest development and support community behind them (being built on Drupal). I would like to share another free project management tool called PlanningForce Express Planner ( http://www.planningforce-express.com/express-planner/free-planning-software.php ) which has an automatic scheduling engine; this means that it automatically calculates start-dates and end-dates of projects while eliminating over-allocation problems. List could be completed with Project’Or RIA (http://projectorria.toolware.fr). This simple to use tool gets a growing community, mostly thanks to its ergponomy and variety of funcitonalities.